What happens when nothing happens? Georges Perec, An Attempt at Exhausting a Place in Paris, Wakefield Press, 2010. Georges Perec’s An Attempt at Exhausting a Place in Paris, a project which required the author to spend three days skulking around various cafés and benches in the place Saint-Sulpice, seems a bizarre and pointless exercise until you realise that it emerged from a much larger and even more quixotic project, Lieux, that aimed to systematically record memories and descriptions of twelve Parisian locations over the course of twelve years. Compared with the elaborate madness of that grand projet, his Attempt seems a relatively sane and manageable task. Here it is excellently translated by Marc Lowenthal, who also provides an informative and impassioned afterword. Perec’s experiments in the everyday, or what he called the ‘infra-ordinary’ were often highly circumscribed. During many of the (largely unpublished) descriptive texts written for the Lieux project, Perec severely limited his field of vision, and curbed the amount of commentary he would provide within the texts: they would either be attempts at neutral description, or they would not be. As a result, one gets the feeling of tuning in to the emergency channel of a shortwave radio: quite a lot of not very much, occasionally punctuated by an unforeseen event. How should we take account of, question, describe what happens every day and recurs every day: the banal, the quotidian, the obvious, the common, the ordinary, the infra-ordinary, the habitual. […] How are we to speak of these ‘common things’, how to track them down rather, flush them out, wrest them from the dross in which they remain mired, how to give them a meaning, a tongue, to let them, finally, speak of what is, of what we are. […] To question that which seems to have ceased forever to astonish us. In this, Attempt provides an excellent summary of what Perec had been trying to achieve with his Lieux project. It illustrates the importance Perec places in a concentrated and prolonged engagement with observing a particular location. It also illustrates the difficulty of successfully achieving such a task: Perec gets bored, he wanders off to talk to friends he’s just seen get off the bus. He admits at one point that he’d broken away from writing for 45 minutes in order to eat some lunch and smoke a few cigarettes. But it also shows the method that Perec has developed to deal with observing urban space. Like a slightly refined version of the children’s game I-Spy, Perec begins his first text by listing all the letters of the alphabet he can see within his field of vision: ‘KLM’, ‘an uppercase “P” for Parking’ before listing symbols, such as arrows on signs, and picking out numbers on plaques, streetsigns and buses. An 86 passes by. An 87 passes by. A 63 passes by. A 96 passes by. A 70 passes by. It is twenty after one. Return (uncertain) of previously seen individuals: a young boy in a navy blue peacoat holding a plastic bag in his hand passes by the café again. An 86 passes by. An 86 passes by. A 63 passes by. Perec is constantly on the lookout for patterns, and he seems to find his most promising material in the movement of a group of pigeons around the square. At one point, after recording that about 200 pigeons are sitting in the fountain grooming themselves, he remarks that ‘the pigeons take a trip round the square’. This is just a small excerpt from the ongoing relationship that develops between Perec and the pigeons over the course of three days; like the passage of the buses, the pigeons are a constant in the square, and Perec’s attention is drawn to them whenever no other details draw his eye. On the sidewalk, there is a man shaken, but not yet ravaged, by tics (movements of the shoulder as if he were experiencing a continual itching in the neck); he holds his cigarette the same way I do (between the middle finger and the ring finger): it’s the first time I’ve come across someone else with this habit. Rather than pathologizing another’s unusual behaviour, (as, for example, an urban description by Virginia Woolf might), Perec gives the man some dignity (he is ‘shaken’ but not ‘ravaged’ by tics) before ultimately finding some common ground: they share a highly unusual way of gripping a cigarette. These little details begin to accrue in Perec’s Attempt, and ultimately add up to make a book that is sometimes frustrating, but more frequently charming, one that tells you much about the difficulty of observing what happens when nothing happens, while giving you a glimpse into the wonderfully elaborate and obsessive world of Georges Perec. 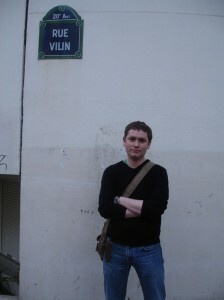 Karl Whitney is a writer and 3:AM editor based in Dublin, Ireland. He has written for the Guardian, the Irish Times and the Belfast Telegraph. First published in 3:AM Magazine: Wednesday, November 17th, 2010.